Absolute Aesthetics use an Nd:Yag laser which is now regarded as the ultimate hair removal laser system which encompasses the latest improvements in hair removal treatment. It’s fast pulse action and large coverage area means much quicker treatment times when compared to other traditional laser systems. 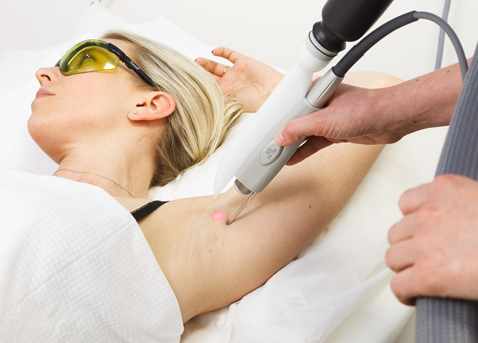 The principle of laser hair removal is to use the heat of the laser to target the colour pigment in the hair without damaging the surrounding skin. As the laser light is absorbed by the hair, it cauterises the follicle at the base, killing the follicle and preventing further hair growth. We recommend a course of 6 to 8 sessions of laser hair removal but occasionally additional sessions are required. It is suitable for all skin types and is a very effective treatment. Laser hair removal is not so successful with blonde or white hair – this is best treated with a course of electrolysis. There are many at home treatments to remove facial hair and body hair. Although these are effective, the results are temporary and the hair will re-grow. 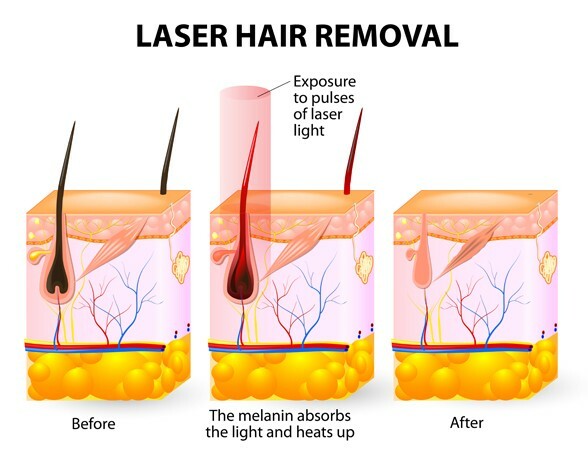 Laser hair removal will permanently reduce hair growth by up to 80% in most people. Laser hair removal is a safe treatment and can be used to remove facial hair and body hair. Some of the most popular areas to be treated are the upper lip, chin, bikini line, lower leg and back.